We recently hosted Netta Barzilai, winner of the 2018 Eurovision Song Contest, at the MyHeritage headquarters to reveal her incredible family history and MyHeritage DNA results. Netta’s DNA and family history reveal is part of our One Big Family project, where we’re partnering with some of the biggest stars in Eurovision history to reveal their family stories through the MyHeritage DNA test and family history research. For many fans, Netta’s music represents a diversity of sounds and influences. Her DNA results and fascinating family history discoveries reflect that same unique mix. Were her MyHeritage DNA results as diverse as her music? Who in her family had the greatest influence on the artist she is today? Netta’s excitement was palpable throughout our family history reveal. The photos, records, and MyHeritage DNA results showed Netta the diverse mix of influences that have shaped her into who she is today. Get the full scoop on Netta’s family history and MyHeritage DNA results. Netta is one of 45 Eurovision stars who are about to discover their family’s past and reveal their MyHeritage DNA results as part of our One Big Family project. In addition to the One Big Family project, as the Presenting Partner of the 2019 Eurovision Song Contest, we are excited to announce the launch of our dedicated MyHeritage Eurovision site! Visit the Eurovision Fun Zone, where you’ll discover your Eurovision doppelgänger with our recently launched Eurovision Look-alike App, or test your Eurovision knowledge with our fun interactive quizzes! Share your look-alike and quiz results with friends and family and challenge them to do the same! The MyHeritage Eurovision Bus Tour is headed to a European city near you! Find the bus and belt out your favorite Eurovision tunes for a chance to win a VIP vacation package to the 2019 Eurovision Song Contest! 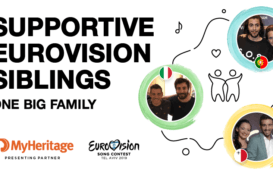 You’ll also enjoy some great Eurovision swag and meet several Eurovision stars, past and present, who are part of our One Big Family project. Can’t wait for the bus tour? Pick up a limited-edition Eurovision themed DNA kit. These beautifully designed kits highlight the best in Eurovision history and make the perfect gift for every Eurovision fan! There are many more exciting announcements on the horizon as we countdown to the 2019 Eurovision Song Contest. Make sure to visit the MyHeritage Eurovision site daily to stay on top of the latest news!